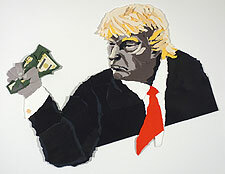 Blood and Tears by Ellen Bronstein, acrylics and exotic woods on board, 24"x18"
Fist Full of Dollars by Barbara Milot, paper and glue, 30"x22"
Raised Voices: Local Artists Resist! It's been eight months in the planning ... What, where, how to do something to relieve the nagging depression and dismay over the state of the state under the current administration? Jackie Abrams speaks of having wanted to do something about her own dark state of mind. Wanting to find others who shared her vision for an art show that would be a catalyst for self expression and a catharsis for feelings of isolation and helplessness.... And find them she did in the four other organizers of Raised Voices: Local Artists Resist!—all artists with a strong sense of community: Kris McDermet, Kay Curtis, Petria Mitchell, and myself, Arlene Distler. I came into the proceedings late, as the sole writer on board. A venue was sought that could accommodate a large amount of work on its walls, that was a public space with easy access, and that had at least one person present who would help answer questions during the course of the show. And, voilà, The River Garden—itself the subject of grass-roots efforts to make certain it would remain a public space. Next was reaching out to other artists, writers, and performers within a 50-mile radius, by way of an Open Call. We five kept telling ourselves, "Well, you're allowed two submissions—so at least we'll have ten pieces of art!" As it turned out, we received almost seventy works of art, via email submission, and ended up having to limit what we accepted for the show. This whole judging process, done "blind," caused plenty of anguish, but in many ways was also gratifying. Gratifying for the overall quality of work (even the pieces we couldn't take) and for the depth and breadth of it. 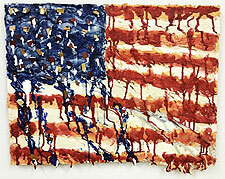 We were struck by the eloquence, directness, and expressiveness of the artist statements, from "I thought tearing paper was an apt thing to do" (which came with an extraordinary collage piece called "A Fist Full of Dollars") to this statement connected to an expressionist painting of the flag entitled "Blood and Tears": "My recent art has emerged from my turbulent and exhausting mix of grief, rage, fellowship, loss, despair, sorrow, urgency, anguish, dread, desire, and still—intact faith in every person who lives and works and suffers and prays in our beautiful imperfect democracy." indigNATION by Walter Slowinski, encaustic on plywood, 26"x7"
This statement and its attendant painting captures so well the spirit of this show! Hope. Outrage. Vision. We hope you will come by for the Gallery Walk reception, and come again to spend quality time with these pieces, many made specifically for this exhibit. Jackie Abrams, Sue Aldridge, Monserrat Archbald, Barbara Baribeau, Karen Becker, Ellen Bronstein, Stuart Copans, Kay Curtis, Sloan Dawson, John Dimick, Arlene Distler, Wayne Estey, Suzanne Flynt, Kathleen Harwood, Laura Kaye, Dolores Klaich, Isabel Lenssen, Lodiza LePore, Stephen Lloyd, Naomi Lindenfeld, Mel Martin, Kris McDermet, Barbara Milot, Petria Mitchell, Greg Moschetti, Sharon Myers, Gene Parulis, Leonard Ragouzeos, Deidra Razzaque, Susan Rosano, Nina Rossi, Deidre Scherer, Helen Schmidt, Lori Schreiner, Kathleen Sims, Walter Slowinski, Jorika Stockwell, and Toby Welch. All the work on display is for sale with either 50% or 100% of proceeds going to the following three organizations: the American Civil Liberties Union Foundation of Vermont, Planned Parenthood of Northern New England - Brattleboro, and the Vermont Workers' Center. 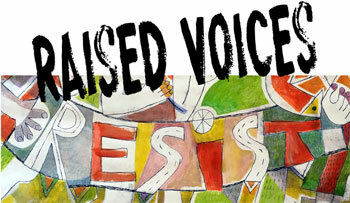 The opening reception for Raised Voices: Local Artists Resist! will take place from 5:30 to 8:30 p.m. on Friday, May 4, at the Robert H. Gibson River Garden, 157 Main St., Brattleboro. It will feature luscious refreshments, interactive sculptures, performances between 6:00 and 7:00 p.m. by Silky Caterwaul and Cyrus Shaoul, and the possibility of a visit by Vermont Lt. Gov. David Zuckerman and area legislators. For all questions about the opening reception and exhibit, email: resistartists2018@gmail.com.